Ourem is located in central Portugal north of Lisbon. This area was occupied by the Arabs until 1136 when it was reconquered by the Christians. King Afonso Henriques gave Ourem to his daughter Princess Theresa, who granted feudal rights to encourage settlerments and development. The Castle Ourem was quite a stronghold and everything was more or less developed around it, as it was the town's nucleus. The town flourished under Count Afonso, and during the 15th century a palace was erected within the castle walls. When the Count eventually died he was buried in a beautiful Gothic tomb which rests in the crypt of the main church. Diogo Pires-o-Velho was the creator of the tomb and one of Portugal's most prominent sculptors at the time. A great deal of Ourem was damaged in the earthquake of 1755 and during the Napoleonic invasions but has since been restored. One unique feature of the town is the Pousada de Ourem (Hotel Conde de Ourem) which is part of the Pousada group. Built from a cluster of historical houses, it has been renovated to a very high standard with all the contemporary comforts and facilities making it a delightful place to base yourself while you explore this region. Ourem is only 12km from Fatima, a medieval walled town that has become one of the most famous pilgrimage centres in the world. Fatima receives millions of pilgrims and visitors each year and has earned its fame because of the apparitions of the Virgin Mary. It is said the Mother of God appeared six times to three shepherd children just outside of Fatima in 1917. The apparitions happened over a period of five months and always on the 13th day of the month. As word spread of these miracles, people travelled far and wide to come to Fatima. Over 60,000 people witnessed the final vision as the skies opened up and the sun became a swirling ball of fire casting down multi-coloured beams of light to earth. Since then thousands make the pilgrimage to Fatima in homage to this sacred place. A chapel was built on the site of the apparitions and nearby a large Basilica was erected. Two of the shepherd children did not reach adulthood, and their tombs rest within the Basilica. The third child was a young girl who grew up to become a nun and lived to be 98 years old. She too was buried at Fatima. This fascinating story is told in more detail at the local wax museum in town. East of Ourem is the city of Tomar, a World Heritage Site brimming with history and beautiful architecture. One of its most famous historical sites is the Convento do Cristo. This was the headquarters for the medieval order of the Knights Templar, and where Henry the Navigator planned many of his exploratory voyages around the world. Inside are beautiful murals and sculptures and no less than eight cloisters. In 1810 the convent was turned into barracks by Napoleon’s troops which unfortunately caused some considerable damage. However, it is still one of Portugal’s most important architectural legacies. The main square in the city is the Praca de Republica which is the perfect place to stop for a coffee or a bite to eat. It is also particularly delightful to stroll through after dinner when it is illuminated. Located on the square is the 12th century Church of Sao Joao Baptista which was recently restored, and has been one of the main meeting places and place of worship since the Middle Ages. In the centre of the city is the Parque do Mouchao which is a popular shady retreat during the hot summer months. The River Nabao runs right through it creating several separate areas to the park linked by bridges. Situated on the banks of the river is a wooden water wheel that is still in full working order. If you are travelling with children, the park also offers a very well equipped playground and swimming pool. The Templar Castle is another must see attraction which was built in the 12th century and overlooks the town. 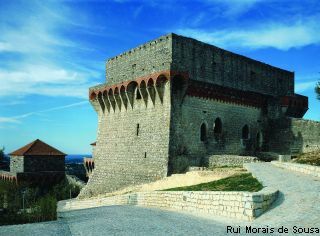 It was part of a defence system to protect the area from the Moors and remained a stronghold for almost two centuries during the Middle Ages. Inside is a citadel and keep protected by a strong outer defensive wall. The concept of a keep was introduced by the Templar Knights, and this particular keep is one of the oldest in the country. The castle was also one of the first to have round towers for it was thought they were more resistant to attack than the traditional square tower. Within the outer walls there are still some ruins of the original dwellings. Perched on a hill not far from the Castle is the Chapel of Nossa Senhora da Conceicao. It was originally built with the intention of being King Jao III's final resting place. But by the time he died in 1557 it was decided to take his body to Lisbon because of the political strife at the time. The chapel consists of three naives, has a vaulted ceiling, and a central tower. It is very decorative inside and has a beautifully landscaped churchyard and terraced garden. You can also get some wonderful views of the city from the Chapel because of its elevated position. 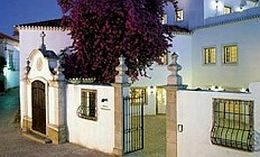 Obviously there is a lot to explore in this area, and Ourem is a perfect place to base yourself as the Pousada de Ourem can not only provide comfortable accommodation but also excellent local cuisine.